Thanks to the support of people like you, John C. Wilson Park was established in 2006, replacing a water park that was destined to become a junk car lot. Located on Cummings Highway at the north end of Lookout Mountain, this public wayside park is within the Chattanooga city limits, just a short drive from downtown. 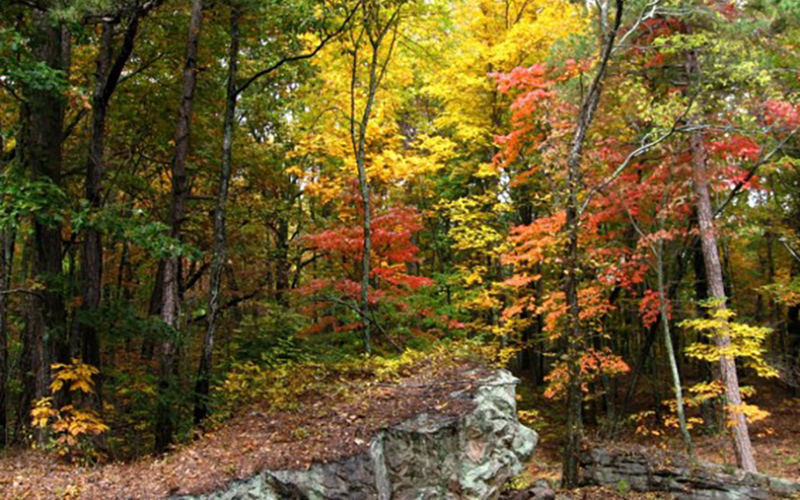 Along with the help of volunteers, Lookout Mountain Conservancy manages the park to provide recreational access to hiking trails that traverse the north and east slopes of Lookout Mountain. With its beautiful views of the Tennessee River and Chattanooga, the park provides our community with a greenspace in which to reflect and recharge. Among the spring wildflowers, majestic oaks and fragrant sassafras trees, tread quietly—you may chance upon migratory resting spots for our area's hawks and falcons. The park is equally important to our environmental education program—working with inner city youth to learn leadership skills and land conservation practices. Enjoy John C. Wilson Park and experience Lookout Mountain Conservancy's pledge to protect important habitat for plants and animals, as well as its commitment to growing environmental leaders among our young people. Approximately three miles of walking, hiking and biking trails leading to the Guild-Hardy Trail. The John C. Wilson park trails are considered easy to moderately easy hiking. They are not wheelchair accessible at this time. A beautiful overlook with benches where you can enjoy sunsets of the valley or watch soaring birds overhead. Lovely spring wildflowers, soft summer breezes, and crisp winter views looking down the mountain towards Moccasin Bend and the Tennessee River. A parking lot for your car or bike. Please be considerate of other visitors. No loud radios. Pets must be on a leash for other’s safety and enjoyment, as well as ensuring that wildlife are not accidentally harassed. No motorized vehicles are permitted on the trails or outside of the parking area without permission from Lookout Mountain Conservancy.